Note: Our American readers may not be aware but the above retro style bicycle is the sort of thing that modern Euro hipsters drive around town in. The double top bar and front carrying cradle are the attributes that make this bike so much cooler than granddad’s version. Such a nice test rig has seldom been observed! You can read up on the research that was done at the University of Vienna by Adrian Dabrowski, Sebastian Busch and Roland Stelzer over at the openbr24 project on SourceForge. They also published a paper titled “A Digital Interface for Imagery and Control of a Navico/Lowrance Broadband Radar” in the Proceedings of International Robotic Sailing Conference published by Springer. The pre-press article in PDF is accessible on the project page. It will be interesting to hear when the roboat project, whose goal it is to develop completely autonomous boats that generally use either solar PV cells or wind (sails!) to get from A to B, will integrate their radar picture and start steering based on radar. As far as I’m aware they are still in the integration phase. 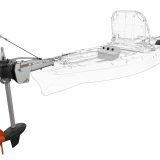 I’m not so sure us real boaters really care about autonomous boats but whatever they get to there is going to be a huge spin-off, and the first result is already here as you’ll see below. I’m not superstitious but I do believe in serendipity: in early 2012 Dave Register, who is the lead developer of OpenCPN, was cruising in the Bahama’s when he had access to a buddy’s Garmin radar, and was apparently intrigued enough to find out how it worked and developed software to interface with it. In March 2012 he wrote this post on Cruisers Forum where he announced an OpenCPN plugin. At the moment if you have a Garmin ethernet radar scanner you can download OpenCPN and add a Windows plugin. If you run OS X or Linux you need to compile the plugin from source. In all versions your display driver must support OpenGL — the code to do this on older video cards just hasn’t been written yet. So this won’t work on your old(er) laptop. You need something with a bit of horsepower in the videocard. After Dave Register started with the Garmin radar plugin it was quiet for a few months. 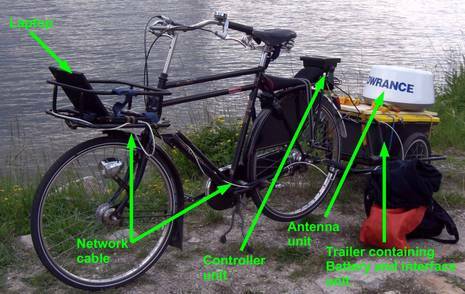 Then late last year the research of Dabrowski, Busch and Stelzer (the guys with the bike) was picked up by Dave Cowell; he used Dave Register’s Garmin code as a template to write a BR24 plugin for OpenCPN. His implementation allows you to use the BR24 (and 3G version) in OpenCPN. It can operate in “slave” mode, where the PC is just listening in on the data sent to the chartplotter, or in master mode where you don’t need a chartplotter at all. So I contacted Dave Cowell and he sent me a preliminary version of the plugin that I then installed and ran on my on-board PC just fine. Installing a plugin in OpenCPN is simple: drop the file in the plugin directory, then enable it in the settings pane. The user interface gains a new Radar button and if you right-click on the chart you can call up the tuning pane. Personally I’m going to use this as a backup solution in case of an issue with my chartplotter. There has been a lot of interest when “free range” radar has been discussed previously on Panbo. But as you can imagine, the story is not yet complete. Many features that radars offer such as guard zones, EBL (Electronic Bearing Line) and (M)ARPA aren’t implemented yet. 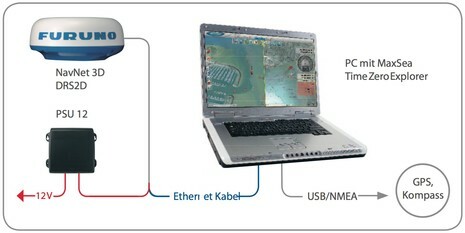 The display algorithms that convert the data stream can be further improved. Resolution and sharpness can be improved. Other brands (Raymarine, Furuno) and types (Navico 4G) can be supported. Since this is done by only a few volunteers I’m sure help will be appreciated. I suggest that if you are willing and capable to help that you head over to the OpenCPN forum. Next story USS Guardian aground, DNC chart error? Previous story Garmin Quatix, best ‘aquatics’ watch yet? This is a really interesting development and many thanks to Kees for trying it and reporting on it so well. Hopefully he’ll do a follow up once he’s had a chance to try the OpenCPN Broadband Radar setup underway. But I do have questions and concerns 😉 For one thing, I’m not sure that either radar plugin has been well tested by anyone yet. The only underway screen shots I’ve seen yet are the two put up on cruisersforum by ChuckSK, http://goo.gl/E1v8M So please, folks, moderate your expectations and be careful. Perhaps bigger issues — especially if GRadar and “BRadar” (I just made that up) are proven and improved — are legality and ethics. Actually, I have no idea if either is an issue but I wonder. I did a little research into reverse engineering and while I gathered that there are cases where it was found to be perfectly legitimate to use it to gain compatibility with a given product, the practice is contentious and there seems to be a question of ethics beyond the law. I’d like to hear opinions from all sides. What the OpenCPN folks are doing seems pretty innocent to me, but what if some company starts selling a charting program with access to Garmin, Navico and other Ethernet radars? Would it be legal? Would it be fair to the radar manufacturers? Could they use the work of the two Daves who created the plugins? Somebody better tell Steve Roberts ( http://microship.com/ ) about this! This is broadband FMCW radar, which sends at such low power that it causes no heating of body parts whatsoever. There are huge differences in the legality of reverse engineering between jurisdictions. Whereas it is (almost) illegal in some, there are countries — including most European ones — where the law prohibits contracts from making any clauses on reverse engineering. – Austrian university work on BR24 protocol. The latter is under GPL 2+. I’m no lawyer, so I don’t know whether the GPL also protects the -ideas- in the product, or just the implementation. The latter has been proven in court to hold up. If someone were to make software that uses this, it needs to be released under GPL as well. University work is usually public domain. I think that it would be hard for Navico to restrict software that uses this knowledge. Legality of these efforts aside, it would be good if the existence of a credible threat to put an interface to broadband radar into mainstream navigation software prompted Navico to license the specs on reasonable terms. I just want CE to support the stuff! I totally agree. I have been rebuilding the electronics on my boat with Coastal Explorer as the chartplotter. When I asked Navico last year at the Miami boatshow about it working with CE, they pointed out that there was at least one package that could interface with their radar (I think the package is from New Zealand). I am not sure Navico will view an open source interface as a threat. I would be interested in testing such an interface for sure. Rosepoint Navigation almost went the same way with Coastal Explorer but according to a post on their forum “the deal basically fell apart”. I was hoping that Navico would forego the license fee if a Navico MFD was in the system, and they seemed willing, but it hasn’t happened yet. I do know that as a rule, these high technology companies who refuse to join together when there is concurrence between their products and their consumers tend not to do well in the marketplace in the end because of dilution of talent, and resources wasted pushing against each other. You can go back to the Wright brothers and their long fight with ex-employee Glen Curtiss for a case in point. Microsoft got big in part because of Bill’s willingness to cross license other developers and his habit of simply buying out or freezing out competitors who did not see the wisdom of joining. Apple very nearly went under in the early days because of their refusal to cross license, or even be civil. That Apple struck it rich late in the game is more a fluke than anything else in my opinion. I see job security for a whole nuther bunch of lawyers, setting up a toll booth in the path of progress. about reverse engineering: I think the term is used to mean two different things: I believe that it’s illegal to break an encryption or bypass an effort on the side of the original manufacturer to keep something secret. There is often debate as to what constitutes breaking of an encryption. Reading the information on the Roboat project, it is obvious that Navico makes no attempt to hide the communication between the radar and the plotter. The developers on the Roboat project and those of the plugins for OpenCPN just looked at the data exchanged and made sense of it in order to learn to speak the same language. They didn’t set up staging or a trap or built tools to trick the radar into spelling out it’s secret. They also didn’t impersonate someone, as in a man-in-the-middle attack. They just looked at the data with their eyes (maybe using tcpdump which is as much a cracker’s tool as a voltmeter). In all practical aspects, this is the same as using a universal remote in “learn” mode with the original remote to then be able to control your TV with the universal remote. Or another example: My car is available with a universal garage door opener integrated into the dash that learns from the original door opener. I don’t expect to be sued for illegal reverse engineering from using one of these devices. about Coastal Explorer: Yes, I too would very much like it to support the BR24 radar. When I bought a 4G radar in fall 2011 I had spent more time on that decision than I spent on deciding whether to buy our boat, get married and become a parent combined. In fact, my boat came with an Anritsu radar that uses the very same scanner unit from Koden as the one Rose Point sells (though a later firmware), meaning I could have saved money gong the Koden route. I didn’t. I took it down and I’m not going to put it back. However, I fear that Rose Point does not see longterm commitment to the BR24-platform as financially viable when there are not more than a handful out there willing to go for the Navico license fee and the price of the radar add-on to CE (I venture a guess: every single one of them has already commented to this thread ;-). And as far as I have seen, there is a good part of the functionality of the BR-radar not yet supported by the OpenCPN plugins and the 4G is not supported at all so the open source implementation is probably not a way to go for them. So my plea to Rose Point: If you don’t do the BR-radar then please at least build a way to select from NMEA2000 data per device, not just per port. about Expedition: Yes, I am probably going to go for it. 3G and 4G were supported almost immediately after they were available to the public and when browsing the version history (now condensed for 2012), one gets an idea that BR-support is an ongoing task, not just a one-time effort. Chart support is comparable for me being from Europe, though not for US users as there is no S-57 support. about OpenCPN: I think the product looks pretty strong from their website and almost on par with a commercial product. I hadn’t expected that and will spend more time on it. I couldn’t find support for the Actisense gateway, though (also not on Actisense’s compatibility page). about Navico: While I don’t think that Navico is subsidizing each unit sold with USD 1300 (the price of the license, almost doubling the price), from comparing the prices of the Koden pcRadar and a Furuno solution (Did you know Furuno now sells a complete solution that runs without a chartplotter? Why didn’t I read about it here? The cost of the license itself is very reasonable, something in the area of EUR 300-400 but the full license to Maxsea TZ is expensive.) I think that if they come down to about half I would call that fair. Or they could of course waive the license if a Navico plotter is found on the network. This is hardly rocket science. Many expensive enterprise software uses “floating licenses” and they all use a license server process piggybacked on some server somewhere in the network to count the licenses in use and compare to the number licensed. This is a tiny little piece of software and it could be even tinier for Navico as their code only runs on Navico plotters and you could, presumably, run any number of radars with at least one plotter. I would much prefer this solution as I think it has a better chance to prompt Rose Point to add BR-support. No I didn’t know, and I had lunch on Friday with FurunoUSA. Maybe in Europe only? Can you post a link? That’s so sad, Henning, but by gosh I think you deserve a Panbo hat 😉 Delivery at METS ok or via mail? Thanks for the hat and no reason to be sad. I’m happy with my boat/marriage/kid decision (most of the time). And I will all let you know how my radar decision turns out. Furuno is running an ad series in the German sailing magazine “Yacht” titled “PC Navigation” and it was on display at the Hamburg boat show and probably is right now at the Düsseldorf boat show where I’ll go next weekend. It’s on page 6 under “PC-Radar Upgradekits” and the price is EUR 455 excluding VAT (~sales tax) but that includes a 48V DC power supply that is needed as the plotter that is normally providing this voltage is missing (which I had seen listed at about 2/3 of that price alone years ago). This requires the most expensive version of Maxsea, the total coming to about EUR 6.000 including 19% VAT I was told. Well done, Henning, but note that us Yankees tend not to know any language but our own, shameful as that may be. I suspect that this may be a Europe-only package at the moment anyway — the Furuno continental operations seem to be particularly independent — but I did learn something possibly relevant at that Friday luncheon. Apparently the NavNet TZT V2 software supports a new Ethernet mode that allows the Furuno network to be on a boat’s LAN/WAN while still maintaining its integrity. This means direct connection to the Internet without using TZT WiFi and the ability to do things like sharing IP cameras with other systems like Maretron N2KView. It may also allow for the straight radar to MaxSea (and Nobeltec) TZ software connection. By the way, the TZT14 now installed on Gizmo required a separate power supply for the DRS2D radar that the MFD12 did not. Excellent! 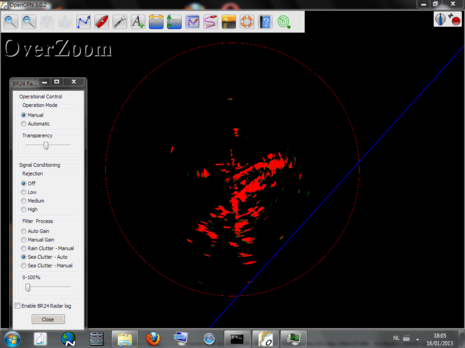 Kees found more detail on the Furuno MaxSea PC Radar — see image added as PS above — and is working on an entry about it. Yes it seems that the PC-Radar Upgradekits are marketed in Germany only at the moment but it does not say anywhere in the price list or the documents that Kees found that export to the US is not permitted. Furuno Germany does not sell to end users but there are a number of dealers, some with an online shop, that I think will be prepared to ship to the US. If you have any trouble locating one, I will help. I wonder why this is offered in Europe only. The cost of the Maxsea license and the PC-Radar license is more than that of an 8” Furuno plotter and almost all of it is net profit as there is no hardware cost other than the power supply. But in any case, Maxsea does not really do it for me. Ben just said “I say be skeptical about them but use as many as you can.” So how many different charts can you use with Maxsea? One as far as I know, Mapmedia. In addition to NOAA S.57, CE supports C-Map, BSB including v4 and nv.digital. 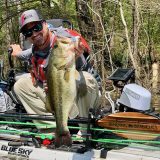 Expedition supports BSB incl. v4, C-Map and nv.digital. If it’s important for you, you could get SeaPro to use UK Admiralty ARCS charts and then you would really only need Fugawi which supports Navionics to have coverage for pretty much every chart format in existence. 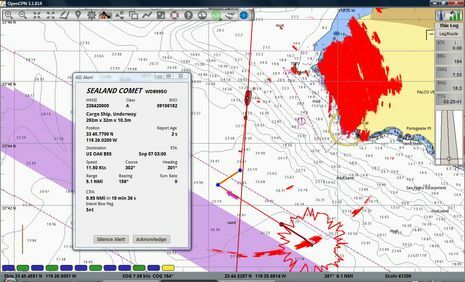 Outside of the coverage area of NOAA, if you use a standard chartplotter, you are tied to Navionics, C-Map or either of them in Mapmedia flavor. NV charts is only just breaking this up for Navico plotters. In 2010 I downloaded the Navionics app for Android and used it to compare to my NV charts while passing through the Schlei “river” (actually a fjord as it doesn’t flow). I found that about one third or one quarter of all navigational aids on the Navionics charts were misplaced, missing or of a different type (like a green channel marker where there was actually a yellow/black cardinal). About 3 years before, all the buoys in this area were replaced with plastic ones and apparently also changed and moved. This told me for a fact that the Navionics cartography was a full 3 years out of date. Wow! Kees or Hendrik might tell you how much the Waddenzee might change in 3 years. Many of the channels marked on a chart that old will now run over dry land, not just uncovered at low tide but completely dry. Or channels may have been rerouted the other way around a shoal. I think what counts is not to get “the best” but to have a choice. 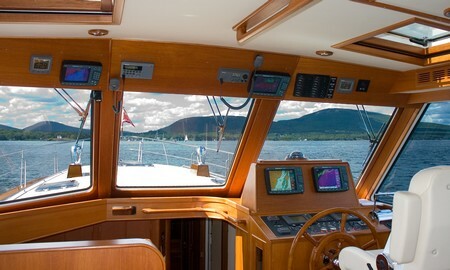 There will be areas where Navionics is the best and when I get there, I can install Fugawi and buy a Navionics module. 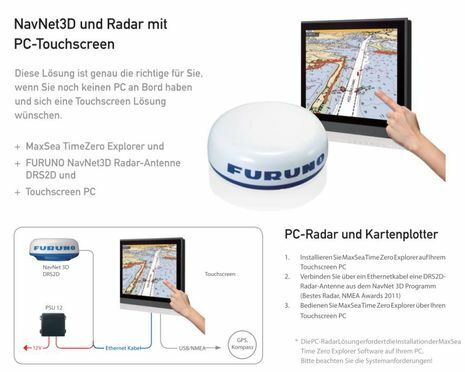 The Furuno ‘PC Radar’ solution is also marketed in France…first noticed reading a Maxsea post on Sam Davies’ Vendee Globe entry (http://blog.maxsea.com/2012/03/26/furuno-maxsea-sponsor-sam-davies/), and it’s on the local Furuno distributor site as well: http://www.furuno.fr/Produit.php?&Page=Produits&Famille=15001&Produit=RADAR-PC. What I have been told so far is the only requirement to hook up a DRS Radar to PC is Maxsea TZ Explorer, so approx. 1600 Euros on top of the radar itself, no other additional license. Allegedly all the radar functionality available using an MFD can be driven from one’s PC…will find out for sure soon enough! Thanks, Matt. Kees is working on an entry and I’ve been nosing around too. Unfortunately FurunoUSA has no plans to offer PC Radar (or Radar-PC as the French put it). Also, apparently there’s one more component that doesn’t show in the diagrams and that’s a bit of software that makes it possible. Hi Henning, I’m a little confused by your dismissal of MapMedia charts. I understand that they do reformat everything they offer, and that can lead to sluggish updating, but they do offer all NOAA, Navionics, and C-Map basic cartography I think. And some other stuff. I’ve only had a few days with the TZT14 Furuno loaned me but I did see two types of Bahamas vector charts and some nice looking raster charts (though I’m not sure the source and the MapMedia catalog doesn’t seem to say). Also I heard that MapMedia would like to use NV-Charts but so far NV isn’t interested. It was not my intention to dismiss Mapmedia. The problem that I have with chartplotters is lack of choice of cartography. It was my understanding that Mapmedia consists of reformatted Navionics (until 2 years ago) and C-Map (currently) data with added goodies like aerial photography and marina information. What you mention sounds as if in US waters you can switch between NOAA rasters, NOAAA vectors and C-Map and Navionics all being part of a Mapmedia package and on the card currently in your plotter. If so then that is pretty good choice. When considering chart update periods there is an important difference between how many updates are made available in a year on one hand and the gap between when updates to navigational data (like changes to navaids) are published by a hydrographical office and when those changes are incorporated into the cartography on the other hand. In one specific area at one specific time I found the latter to be three years and that is unacceptable. All advertisements I read only mention the former period. Or they may call it an update when they have updated the phone number of the harbormaster or that a marina now has a dryer in addition to the washer. At the same time they may have years worth of information from HOs sitting in their inbox about sands that have shifted, lights that are shut down, channels that are below charted depth. I’m afraid to ever learn the truth about this. I fear they call it freshest data because they don’t dare call it fresh data. Someone please tell me I’m seeing this too negative. But note that my fear is for non-US waters. Any information on why NV isn’t interested? I have to say that Navionics Freshest Data is working quite well here in the Waddenzee. I’ve seen two weeks between the notice to mariners and the new buoy location. I guess it also depends on which hydrographic office is involved. My main complaint is that you cannot easily query how old a particular nav item is, nor do you get a summary like ” notices x to y applied”. This is very good to hear. I have seen a 2-3 week turnaround once myself (with NV charts) so I believe the process is set up correctly in Germany. That experience really made my day. I find this so much more important than any marina information. When I find time I will again compare the Navionics charts on my smartphone to my regular charts in the Schlei. And I fully agree that vector charts could easily incorporate a timestamp of when a certain object was last updated, not when the chart was published but when a particular object was last changed. This would help to tell you what updates were applied in any chart update. The NV monthly updates come as updated raster charts where of course it is extremely hard to tell the difference. But they also publish PDF files with all changes neatly shown to print, cut out and glue to the paper charts. I have often looked at these and I find mostly relevant changes. This gives me a good idea of the number of changes to an average chart area. In fact, when I have different chart types to compare (as I plan), I should take the time to check each NV chart change against the next C-Map update or the one after to get a picture – however, I don’t make promises here. In the end, criminal investigator is not my chosen profession. Kees, great entry. I didn’t think this would be interesting, as I much prefer having a dedicated chart plotter that needs no windows / browsers / etc. updates. What especially caught my eye is that when the user has both (chartplotter and PC), OpenCPN effectively communicates to the other device any changes in settings made by the user on either device. Did I understand that correct?  User changes filtering, etc. on the PC it’s not just updated on the radar, the chartplotter reflects the current setting. Is that correct? Does that extend out to alarming? If the PC generates a proximity alarm, the chartplotter will sound? Clear the alarm on the chartplotter and it will clear on the PC? A quick look at the OpenCPN website, and I see AIS is included in OpenCPN. Can you setup your own alarm algorithm with some fancy coding on the PC to be context sensitive (channel, harbor, etc.) and replace the sometimes useless AIS alarms? Does it have to be a PC? Can it be a smartphone? I don’t have an up-to-date Navionics-on-tablet version so I can’t vouch that Freshest Data applies to the charts on there. But I guess the new releases should be since they switched to download-all-at-install to download-on-the-fly, like 2 years ago or so? I invested in the Navionics app first but have since then switched to iNavX, which I’m not sure gets Freshest Data. With my plotter I’m sure and that seems really quite up-to-date, so unlike your experience in the Schlei (did I get it correct that was where you had the out-of-date charts?) Note that the Danish HO is known to be a pain in the *** as they do NOT allow any updates after chart release: Freshest Data on my Danish chart only applies to user updates, not HO updates. My Norwegian and UK+Dutch charts do. For Norway I actually wouldn’t care that much since rocks don’t seem to move much. > OpenCPN effectively communicates to the other device any changes in settings made by the user on either device. Did I understand that correct? User changes filtering, etc. on the PC it’s not just updated on the radar, the chartplotter reflects the current setting. Is that correct? Yes, as any command to the scanner changing a radar setting such as range, gain etc. influences the output of the scanner. > Does that extend out to alarming? If the PC generates a proximity alarm, the chartplotter will sound? Clear the alarm on the chartplotter and it will clear on the PC? Not to my knowledge. First of all, MARPA/alarms etc. are generated by the plotter not the scanner, so OpenCPN has no knowledge of them at all. Secondly, the radar plugin for OpenCPN doesn’t have any of these features. > A quick look at the OpenCPN website, and I see AIS is included in OpenCPN. Can you setup your own alarm algorithm with some fancy coding on the PC to be context sensitive (channel, harbor, etc.) and replace the sometimes useless AIS alarms? Absolutely! It’s open source, so go ahead and create them. and look at how it shows you the relative position of the other ship compared to yourself at CPA. EVERY AIS DISPLAY SHOULD HAVE THIS FEATURE! I don’t believe you need to go as expensive as that. I haven’t tried it yet, but I think you can use the $1,000 MaxSea Navigator, an Ethernet hub and a DRS/DRA radar. That would be considerably less than the Commander a FAR series radar. I am thinking about buying a 3G broadband radar, but the thought of buying a €700+ tiny display/chartplotter which I will use for radardisplay only is keeping me back. 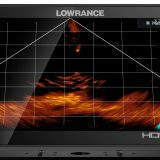 I hope someone wil be able to answer my question: can I hook up a 3G (Lowrance etc.) radar to a dedicated PC with suitable software to view and operate the radar ? Is an electronic compass a must in this case or will a GPS do ? Overlay on a chart would be a nice bonus but a good radar view is a must. There is a plugin for OpenCPN, see http://opencpn.org/ocpn/navico_radar and http://opencpn-navico-radar-plugin.github.io. The plugin requires a wired ethernet connection between radar and PC, WiFi will only work reliably when you are able to get your WiFi router to produce high bit rate multicasts. Furthermore, you need a GPS and an electronic compass, and in most countries the WMM plugin. In the Netherlands the magnetic variation is negligible, so you don’t need the WMM. I am intrigued by your requirement though. Why no charts but radar is a must? It sounds as if you are Dutch, and if you are thinking of using the radar on inland waters, including the IJsselmeer and Waddenzee, you’ll have the authorities after you when you sail in dense fog as you don’t have the necessary equipment or license. Just check the BPR/RPR on radar equipment. indeed, I’m very well aware of the rules and regulations regarding radar use. I do sail for my pleasure and will stay put in adverse weather. It’s just that as an old radar technician (think klystrons the size of an old-fashioned milk bottles) I’m fascinated by the broadband radars for sale now. Especially the definition which seems to be very near that of a 6′ puls fed antenna. A loss of range has no meaning on the large rivers. Beeing on a pension budget I would really like to use a pc based ‘PPI’ instead of the €700 minimum small displays wich have a lot of other functions I already have on board. Also the PC allows for a 15″ screen for a fraction of the cost. 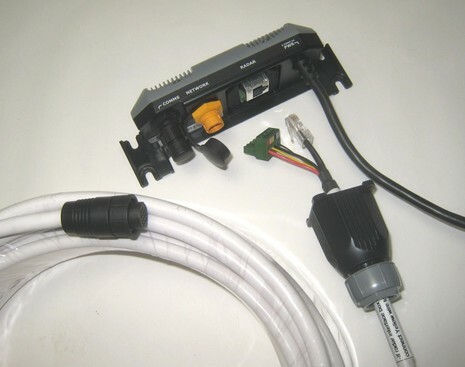 €195 buys a NMEA 2000 GPS+fluxgate compass+ROTI which would leave me €500 for a PC, Monitor and NMEA wiring. As for the radar and charts question: I use PC-Navigo with a class B AIS transponder and that works just fine for me. Using a second PC/Monitor for the radar keeps the dedicated navigation PC running as it does now, on the radar PC I can always use the free ECN charts as an overlay. Leo, keep in touch how it goes. We too wanted just a radar. Do not need overlay, as we know where we are, but it would be nice to see other ships in the fog. Better to watch on a big screen too. Tad. So far I’ve got a nice compact PC housing/power supply and mATX motherboard as a platform for OpenCPN. Will fit it with a 4(-ish)GHz CPU, 8GB RAM and an SSD. I used a GPS / AIS simulator to setup the PC hardware for the navigation software, I use PC-Navigo, made for the European inland waterways and the Dutch coastal waters. Celebrating my birthday (yes, 4th of July …) on the Northsea ! I think you will find the BR24 wasn’t encrypted, at least in the earlier firmware but is now. So, I suspect these reverse engineered solutions might only work with BR24 and not 3G, 4G etc. This is all handled by the Navico solution. We do support it in Exp, but don’t know of anyone else as the cost is prohibitive for most people. The 3G and 4G work very well with the current OpenCPN plugin, with all radar firmware releases. Thank you for the info Kees ! You seem quite knowledgeable regarding opencpn and the 3G/4G radars. I have been given a 4G scanner (that was in a fire). The unit is believed to be functional, but the housing is compromised (somewhat melted). I will see if I can simply buy a replacement housing from Lowrance. I’m not a big software guy, so I’m a little lost with the opencpn and various plug-ins that seem required. Can you help point me to a WIN7 solution that will allow me to control the scanner and just display the radar info? I don’t have the display/control head that originally went with the scanner. I’m working on a radar-only display that will be added to the OpenCPN plugin, but that will take a few more months. You should be able to close the chart window and maximize the radar only window. However, I don’t think a marine radar is such a great weather radar. You’d need to modify the radar scanner so that it points up and out, not just out. Otherwise you will see mainly objects such as buildings, hills etc around you. Not very useful. Can anyone direct me to a protocol description ? I would like to use one of my (2) old Furuno scanners and build the processor to interface to a PC, ideally via NMEA (RS485). My whole system works, but it big, has rotating coils and a CRT in the display. I did say OLD ! unfortunately your radar isnt digital so this isnt possible without an expensive AD converter. The pulse will always be over 15 meter with a radar of that vintage. Sounds like you know what your doing so just simply encode the data in your own format and write a decode. will need to interpolate the acp count to have a half decent bearing resolution.